The Great Brentford Picnic was once again held in St Paul’s Recreation Ground. Locally coordinated by Alix Reeves of Westplay, the event saw a wide range of fun and engaging activities for children of all ages. Amongst other things, youngsters enjoyed participating in face-painting, t-shirt decorating, hat-making, steel drum playing, bubble blowing and real-life table football. Catering was organised by the Cafe of St Paul’s Church in Brentford. 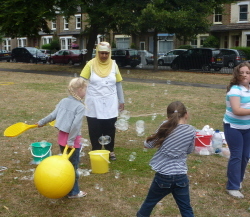 Mary took part in the local Playday which was held on Wednesday 4th August,. Mary Macleod MP met a team from Chiswick and Brentford Your Extended Services (YES), who were on hand to give information on Hounslow Council’s Extended Services scheme (past events have included Yoga for exam-age children, paediatric first aid courses and a Healthy Cookery Club). 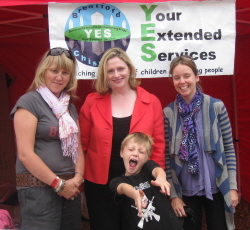 Mary met Liz Gers (Parent Support Adviser) (left) and Claire Collison (Co-ordinator for Brentford and Chiswick) (right) of Brentford and Chiswick YES, with Liz’s son Tom. She also enjoyed lunch from the St Paul’s Church Cafe – where she holds regular surgeries. 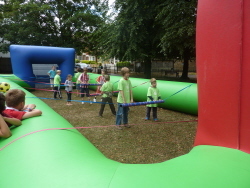 Playday is the annual celebration of children's right to play, coordinated by Play England. It is an annual campaign where, each year, thousands of children and young people get out and play at locally organised events, encouraging the development of community feeling in the process.